Whether you’re on stage or behind the scenes, mental health issues can have a major impact on every aspect of your career and life. Recent studies on the conditions of people working in music indicate that a majority are facing significant health and wellness issues. Join us for a discussion about challenges faced by the music community. With this event, we hope to open a conversation in the local music community on these issues, listen to priorities and needs, work towards de-stigmatizing mental health in our scene, and offer some info on resources and tools available. We've searched high and low for a talented and diverse team of industry pros who will spend the weekend sharing their expertise to help artists grow their music into a business. To kick things off, we’ll get to know our JMM 2018 delegates, finding out how they got started in the industry, the day-to-day work of their jobs, and what makes them tick when it comes to music and the business. Social media is one of the most useful tools in marketing music and engaging fans. At a time when our screens are saturated with ads and attention-seekers, being strategic about social media content is more important than ever. This interactive social media assets review will allow artists to volunteer their own web platforms for constructive comments and tips from our experts on how they can better present themselves to the digital world. Apart from being an artist, being the artist manager may one of the most difficult and demanding positions in the music industry… but why is that? What does a manager do and how does an artist find one? What is the daily interaction like between the artist and their manager? In this Q+A, we’ll be talking with an artist and her manager to find out how that relationship was started, the daily interactions, and how they work together on the future of her career. Besides making great music, the key to having a successful music career is building a network of people who will help move it forward. In this workshop we will discuss how to build a strong network of peers, the various ways to meet industry pros, and the best practices when it comes to pitching music. At a time when there are far more musicians than record labels can take on and the online world opens many doors to self-represented artists, the DIY release is becoming more common than ever. In this workshop we'll discuss realistic timelines, strategies, marketing plans, and publicity to make the most of an independent release. Some artists have hundreds of songs in their back pocket that are never used. Meanwhile, they’ve heard of successes in songwriting, co-writing, and publishing deals, but are unsure of how it all works and the steps it takes to get there. In this panel, artists and publishing professionals who have done the work and experienced the success will offer guidance on how to get those songs into the ears beyond the artist’s current circle. Touring is a great way to build a network and market music — it can also be the most thrilling, which is why it is such a common goal for artists. However doing it with well-attended shows, and without breaking the bank or stamina is more difficult than most people think. This discussion will address the importance of knowing the market, and touring strategically in order to be successful on the road. One-on-one meetings are your opportunity to meet face-to-face with some of the January Music Meeting panelists you might not otherwise have the chance to speak with. These "speed meetings" last about 10 minutes and are designed to give you a chance to introduce yourself and your project, and ask for guidance pertaining to your music career. This can be a great way to build your network by getting your name out, exchanging contact info, and making follow-up after the conference more successful. Meetings are scheduled on a first come, first served basis, and registrants of January Music Meeting and Manitoba Music members will be given priority. Meetings are subject to availability and we cannot guarantee a meeting with your selections. You may have more or less than six meetings based on demand and we may pair you up with a professional you didn't select, but will be valuable in building your network. Sign up for a one-on-one meeting with one of our January Music Meeting panelists. To make sure you’re connecting with the right panelists, it’s a great idea to do some research first. Find out more about this year’s panelists at www.manitobamusic.com/news/read,article/7321 and prepare yourself by reading 8 Tips to Getting the Most from Your One-on-One Meetings. We are in an ever-changing industry where technology is evolving, revenue is shrinking, and there are more DIY musicians than ever. With the constant media cycles, saturated touring markets, and the struggle to keep up, the health of our industry and the health of our artists has become a central concern. How is the industry dealing with this? What are the moves we need to be making as a community, as creators, and as consumers? What does the future of the music business look like? Our brunch (continental-style) will include a wide-ranging discussion with all of our JMM 2018 delegates, as we navigate through this uncertain and exciting transition. The fifth edition of JMM welcomes some of Canada’s top music industry pros in a conference format that includes group sessions, discussion groups, networking mixers, and one-on-one meetings. Reps from the label, agency, management, festival, publishing, and publicity sides of the industry will converge on Winnipeg to discuss the state of Canada’s independent music industry and provide concrete advice on how to succeed in the constantly evolving music business. 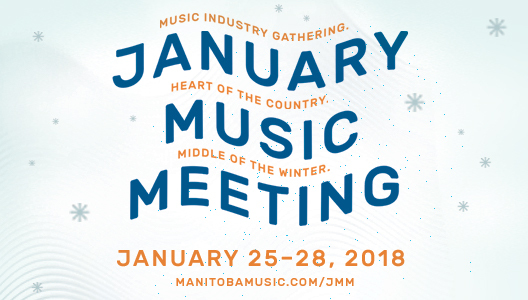 January Music Meeting offers Manitoba's music community a rare opportunity to network with a cross section of tastemakers and experts while connecting with local artists and industry peers. The JMM weekend pass is $55 for Manitoba Music members and $80 for non-members. All January Music Meeting and MusicWorks events will take place in the Manitoba Music Industry Resource Centre, 1-376 Donald Street, unless otherwise listed. Space is limited and advance registration is strongly encouraged. JMM is made possible by the generous support of the Province of Manitoba through Industry Services of Manitoba Education and Training, FACTOR through the financial support of the Government of Canada and Canada's private radio broadcasters, The Jim Pattison Broadcast Group, and The SOCAN Foundation. Stay tuned for panelist details and schedule info.